New Product: The new interactive digital LCD displays are designed from the ground up and are perfect for use as Interactive Digital Sign, Holo-Info-Desk panel. The design of the panels in the DS-I Series are designed for wall, stand or horizontal surface. – Video Intel® GMA X3150HD onboard graphics chipset. The software used on the DS-I series can range from our Omnitapps Multi Touch Content System, SiteKiosk For Kiosk applications, the about to be launched Social Media Signage software. This screen is from a new range we are launching. Floor standing model also available. Specifications subject to change without further notice. During the last half of 2011 we have been extending the Holo-Info-Desk range that includes both projection and flat panel displays to cater for the ever expanding market for large format touch surfaces. The 50 inch bench (pictured configuration) of the Holo-Info-Desk is ideal when you want an in your face size multi touch screen and mobility. The stand packs down to an insignificant size, whilst the screen at 50 inch is still transportable. Pictured is the interface for the ITEX NZ IT conference that was held in Auckland during November where over 400 IT managers were introduced to the Holo-Info-Desk format in both projection and flat panel scenarios. Using a Holo-Info-Desk is ideal for conferences both on the exhibit floor to promote your products but also by the organisers who wish to allow users to discover information about exhibitors, floor plan, seminar speakers and special promotions. 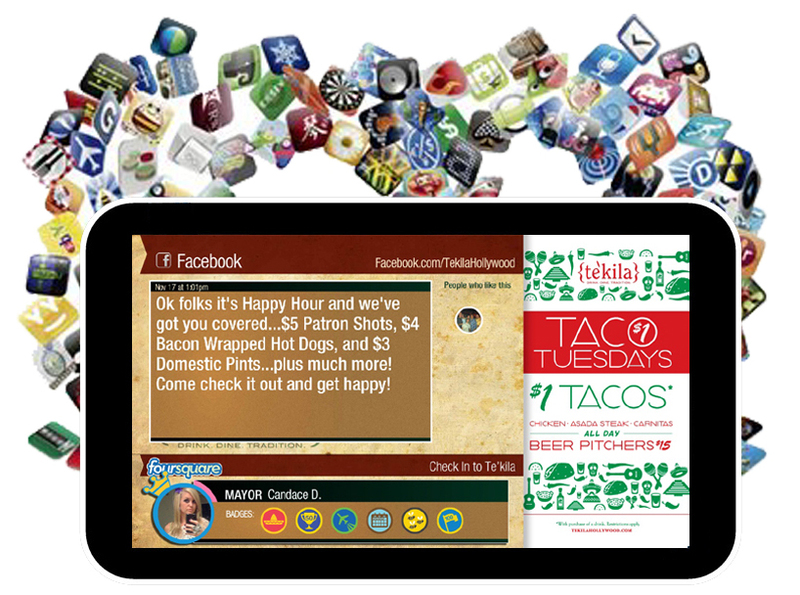 2012 is going to be a great year for the use of Interactive Multi Touch solutions in a diverse and wide range of applications. The year is finishing up with a robust and dynamic application that brings the Holo-Info-Desk alive in ways that customers love. The latest version of Omnitapps (1.3) is now available for your interactive Holo-Info-Desk. 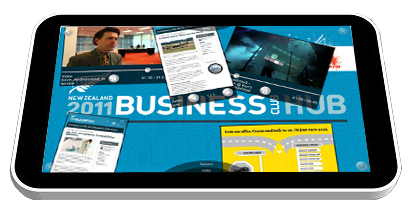 The era of placing a 42 inch LCD screen in your exhibit and hope to create engagement with visitors is a thing of the past. 15 years ago having a 42 inch LCD screen displaying your content and brand might have seemed cool, but today it can demonstrate your presentation are stuck in the past. Thanks to our touch technology and our Interactive Content Management Software means that we can bring any existing LCD screen to be the latest marketing innovation for your exhibit booth, kiosk, retail store. Set the ticker text in order to display your message. This can be text, Twitter tweets but also an RSS feed. With the tickertape you can always display your selected information inside the startpage. 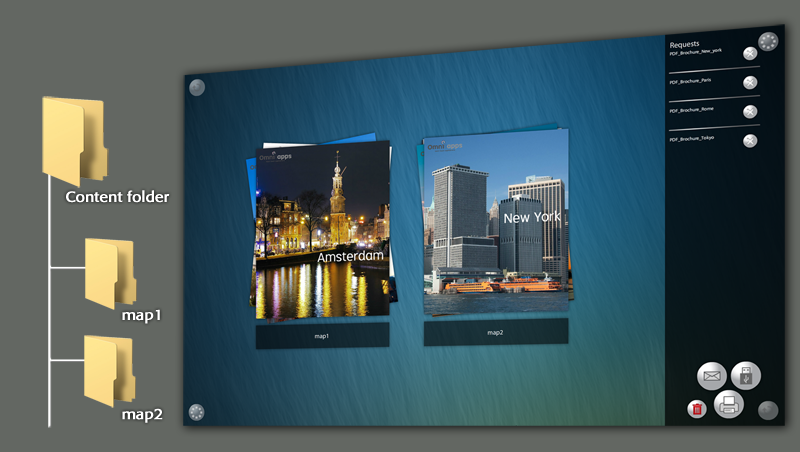 The Brochure capability of the software has taken a big step forward, that has some new enhanced features. With the catagory function you can provide the end-user clear stacks of brochures. The next feature has huge benefits if you have product and service brochure. The Print/E-mail/Save on USB request capability can provide many benefits. With this function you can collect leads. It is possible to send the brochures to your own email, or a colleagues address. In addition to saving paper you know that the brochure will not get lost amongst all the others in the expo bag. Besides it provides an additional opportunity for contacting the visitor as their name and email are automatically collected as part of the process. This creates that all important follow up opportunity post expo. Due to the diversity of the structure you are able to easily switch on or off what applications will appear. So if you are only wanting to display photos then use the Photo slide option, want to create a video player then select that option, web sites etc are all easily switched on or off, or create a media wall and again a simple menu selection.